In 1903, Mary Anderson invented the first windshield wiper blade. Five years later, housewife Melitta Bentz patented a coffee filter system. In the 1950s, bank secretary and single mom Bette Nesmith Graham created Mistake Out (later patented as Liquid Paper®). And for most of her adult life, my mother, Bernice Lueders, was an innovator in bending when life says break. She lived out the antidote for a weary heart, freely dispensing two invaluable ingredients: courage and laughter. March is Women’s History Month, and I think every woman deserves a salute for helping shape history with her own rendition of courage and laughter. Let me give you a brief backstory on my courageous, quick-to-laugh Mom. Born in the Depression era of the 1930s, Bernice learned to appreciate the simple things in life, and she loved connecting with people. Yes, like me, even complete strangers. Mom melded her talkative nature and documenting history with her passion for storytelling, photography, and books. I am my mother’s daughter. But somewhere along the way in Bernice’s late teens, a mysterious medical condition threatened to augment her carefree, adventurous spirit. Incorrectly labeled with schizophrenia and “being crazy,” Bernice endured hospitalizations, shock treatments, and whispered ridicule for not being able to counter her mood swings. I value Mom’s courage to keep optimistic and blend in well with the rest of us. After almost fifty years of living undertreated for bipolar disorder, Mom finally connected with the right doctors and lived in stable freedom. Until … glandular skin cancer raged inside Mom’s beautiful face and chin. The surgeon’s knife left my mom with lengthy face and neck scars, and radiation eventually crumbled her teeth, but Mom never complained about the harsh realities of her cancer. Although the medical treatments compromised her body, Bernice never let her limitations squelch her joy and inner strength. She still made it down to the gas station and grocery store to share her upbeat stories. She chuckled at the daily comics and had us all chuckling with her. Bernice knew just how to invite mirth in others. Sixteen years before Mom was born, socialite Mary Phelps Jacob fashioned a revolutionary undergarment, a “backless brassiere” out of two silk handkerchiefs, pink ribbon, and cord. My mom could fashion revolutionary smiles out of a story, a cup of coffee, and a cookie or two for dunking. Two days before Mom entered the hospital for the last time, she climbed the sagging concrete steps to an unassuming farmhouse to visit and bring a smile to a wheelchair-bound widow. Maybe this is why I visit the hurting and isolated with my pet therapy collie. Giving back runs rich in my heritage. Bernice gave back in everyday ways, and even in her own pain and discomfort, she dug deep to keep bending instead of breaking. Precarious mental health, cancer and facial scars did not define Bernice. She reveled in a hope that goes beyond this life, and seventeen years ago today, Sunday, March 11, 2001, Bernice met that Hope. My gregarious Mom courageously slipped away to heaven to enjoy more coffee and dunk a few cookies. And share a gazillion more chuckles. Such touching insights and memories of your Mom! I dunked some cookies in her honor tonight, Beth, and am humbled by the incredible life and laughter she shared, despite so many troubling times. She truly lives in you and you in her. God’s richest blessings to you both. Bless you, Edie, for your endearing words. Thank you for dunking cookies in Mom’s honor. You know what it’s like to come alongside a parent with some challenges. Thank YOU for modeling how to live and love well. Very touching, Beth. I have struggled all my life with comparing my ‘outside’ to others, and trying to reconcile what I have been given to Hollywood’s version of perfection. They don’t match–and the focus is all wrong! I want to remember this message as I deal with the physical impact of aging and other things that impact my looks and body–to be content with what I have and who I am so that I can focus outward to bless others. Thank you! My dear friend, thank you for your honesty. I think many of us struggle with the warped view of perfection that we encounter everywhere. Yes, our bodies are changing, yet as 2 Cor. 4:16 says, “Therefore we do not lose heart, but though our outer man is decaying, yet our inner man is being renewed day by day.” Here’s something that helped me this week as I was feel low about some body stuff and pain. God DELIGHTS in you! He’s singing over YOU with great joy (Zephaniah 3:17). I cheer you on in refining your focus on whose you are, which gives foundation to who you are. I’d love to call and chat with you more about this, Karen. You are not alone in wanting to truly at peace and content in your own skin. You are beauty full, my friend. Beth, this is one of the most touching, inspiring stories I have ever read. Maybe I’m biased in that it was written by my sweet, storytelling friend who continues to inspire others…but I believe I would feel the same had I never met the author. Dear Bernice…and her dear daughter Beth! Janie, bless you for your encouragement! You can be as biased as you want. 🙂 I wish Mom had met you on this earth. You two would have kept the coffee and cookies flowing for hours and hours sharing humor and stories. My, my, my, my. I can’t wait for our cawfee talks in heaven. Thank you, Beth, for this poignant and bittersweet tribute. I remember your loving, cautiously-candid, and respectful stories about your beloved and vibrant mother who lived Life (with a Capital “L”), no matter what unwelcome assaults assailed her … and your family. You honor Miss Bernice so well and beautifully maintain her dignity. I love and adore you for that and for all of the extraordinary qualities that your dear Mom passed on to you. Mr. and Mrs. Lueders certainly gave us a rare and priceless gem in giving us YOU. You will reunite, again, someday with your joyful mother who set a fine example of what “More Than a Conqueror” looks like. On that day, you will see that very precious lady completely whole, healthy, and happy in the presence of Jesus. Oh, you bring tears, my friend. Thank you for your wonderfully uplifting words. I appreciate everything you wrote and am honored by your encouragement. I want to help others move past the silence and shame that seems to overshadow mental health struggles. Help and hope for mental illness has come so far, yet has an arduous journey ahead. I love your words about my mom being “more than a conqueror.” To know that she is already whole, healthy and happy brings such joy. Great tribute to your wonderful Mom Beth! Thank you, Carrie. I’m grateful that you met my mom and stayed with us on your travels back to Minnesota. You were so gracious and supportive when Mom was enduring one of her hard places. Thank you for that, my friend. That’s good stuff Beth. I deeply appreciate the spotlight shined on her daily courage and laughter, and the joy she could bring by focusing on the people around her. I am encouraged to do the same! Thank you, Teri. Mom just naturally shined courage and laughter. She didn’t read books on it or attend seminars on how to attain these qualities. It was just Bernice being the free spirit God created her to be. Your encouraging words offer me fresh encouragement. Bless you, my friend! Oh, I loved reading this,, how you take me to the time when these indispensable, everyday items were born, how your mom (and we) connect to them, and how you and your mom show us how to bend and white out the mistakes to set things right for a start over. Beautiful, Beth, especially all the brokenness of your sweet mom’s life. I ache for the pain you and she endured, and weep with joy–inspired to live a broken-into-beauty life, a life where light and laughter seep through every crack. Love to you, my friend, for this encouragement again today. My dear, Jeanette, you always inspire me with your poignant words and deep understanding of the broken-into-beauty life. Thank you. Thank you. You fully live the bending life, stretching beyond relentless pain and reaching for that light and laughter seeping through the cracks. Much love and gratitude to you, my friend. May this day bring you delight in the simple things. Lingering over coffee. Nestling with Aspen. Seeing the Divine in signs of spring. Bless you for blessing all who read your words here. Thanks for sharing a beautiful tribute to your Mom. I can’t imagine it was always easy. Thank you, Marie. I appreciate your kind encouragement. You are right. There were dark, jagged times, but the good and the healing far outweighed them. Reality meets wholeness and hope. Much of Mom’s story is about coming back when life wants to count you out. I miss seeing you, Marie. I hope it is well with you. Enjoyed saying “hi” to your mom at the station when I stopped for gas. Ahhhh. True to your sweet loving deal with it humorous ways. …your mom is remembered so precious ! I remember her kind accepting ways…and how your dad loved her for who she was??? yes you are your mother’s daughter ? Thank you so much, Angie. 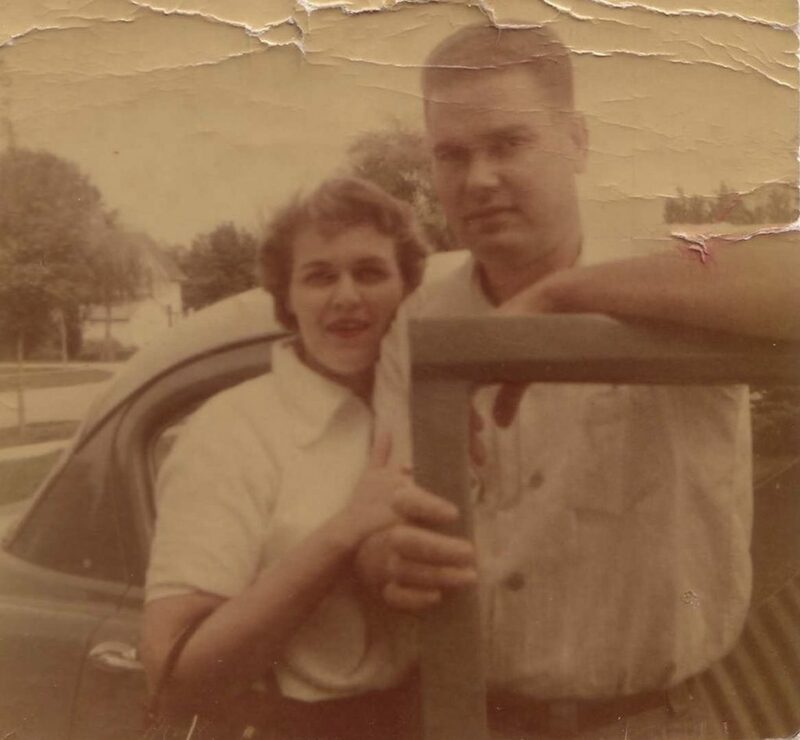 It’s encouraging to know that you knew both my parents and saw such good even in the times that were not so good. Mom was kind and accepting and Dad brought out the best in her. It is fun to think that I love to help others laugh, much in part because of both my parents’ humorous genes. Bless you for being there for us through thick and thin. I will never forget you helping me clean out their bedroom and Mom’s clothes after she passed. And you gave many of those clothes to in-need women in Omaha. Big hugs for your serving us! A beautifully written, heart-tugging tribute to your mother! Thank you so much, Catherine, for your encouraging words. I know you never met my mother, but in getting to know me, you are in many ways, meeting my Mom. I am honored to have you in my life as editor, sister, and friend. God’s fresh hope and courage to you today. Wow! Powerful! Thanks for sharing. We definitely need to meet ?. Thank you, Enne. Yes, let’s look at our calendars, Wendy, er, Enne. What a loving and lovely tribute to your mom, Beth! How special it is that you embody so many of her qualities that, in turn, make you the gifted writer you are today. What a great way to carry on her legacy! Thank you, Lisa. I truly appreciate your kind words of encouragement. It is heartwarming to see many of my mom’s greatest strengths interwoven in my own life.